Looking for the 2019 Film Score Fest? Check out the snazzy new website! Short FILMS with original SCORES performed live by an ORCHESTRA. 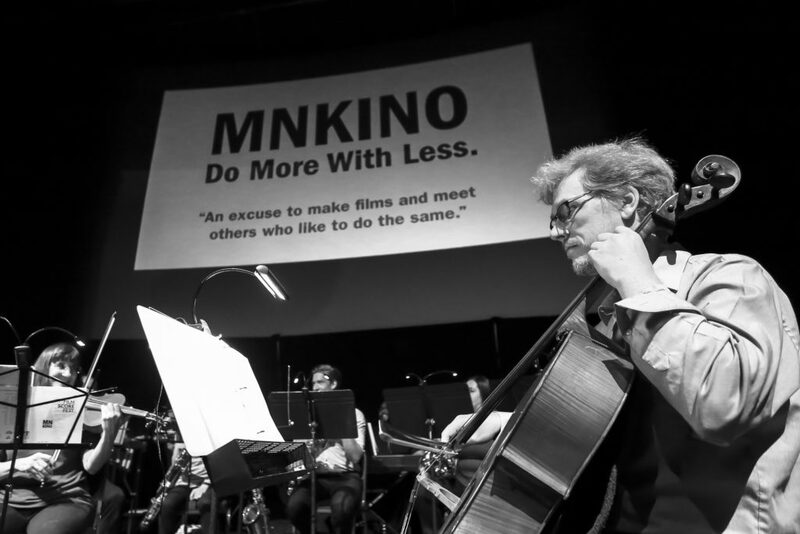 The MNKINO Film Score Fest is an annual event that brings filmmakers, composers, and musicians together to create short films with original scores — performed live by an orchestra! The next Film Score Fest will be held on July 28th, 2018 at the Science Museum of Minnesota. If you’re interested in making a film or composing a score, sign up below by March 18th, 2018, and we’ll help partner you with a filmmaker or composer. Sign up early; we’ll partner you on a first come, first served basis and by location so folks can work together. We’ll let you know who your filmmaker/composer partner is shortly after March 18th, if not before. If you have a filmmaker or composer in mind you’d like to work with, please list this in the sign-up. Filmmakers are encouraged to talk with their composer partners before making the film, to get inspiration and see what role the music can play. By signing up, you are making a commitment to create a film or score. We understand life happens, so if you can no longer participate, let us know ASAP, so we can partner your filmmaker/composer with someone else. We will screen at least 18 films, but our orchestra has a limited amount of scores they can learn. If needed, our screening panel will select films based on: 1) artistic merit, 2) score playability, 3) whether or not they fit in the overall program, and 4) whether or not the films/scores were made locally in Minnesota. You must submit your film to your composer and MNKINO by May 13th. Consider using wetransfer.com, dropbox, or a physical handoff. We will have one of each of these instruments: flute, oboe, Bb clarinet, saxophone (alto, tenor, or bari), bassoon, french horn (in F), Bb trumpet, trombone, tuba, drum set, guitar (classical, steel string, or electric), piano (electronic), harp, violin, viola, cello, double bass, and an additional percussion player, who can play one of the following: two-octave xylophone, glockenspiel, triangle, woodblock, shaker, tambourine, claves, cabasa, bongos, bodhran (Celtic), ashiko (African), djun (African), djembe (African), box drum. Score and parts must be formatted for 8.5 x 11″ paper, vertical layout. Make sure it’s readable by a human conductor and not too tiny. Sunday, March 4th, 3pm to 5pm: Film Score Fest Kick-Off Event at Honey. Mystery Meat reveal and sign-up begins. May 13th: Films must be finished and handed off to your composer and MNKINO. June 10th: Film scores must be finished and sent to mnkino@gmail.com. Here’s a presentation that includes helpful filmmaking and composing tips for your submission. If you have more questions, feel free to email mnkino.gmail.com with filmmaking questions and charlie@composerquest.com with composing questions. MNKINO is not just for film school graduates, MFA candidates, or videographers. It’s for you! If you never made a film or need the resources to create your film, check out at Saint Paul Neighborhood Network, a community access center. They’ll be providing to affordable classes at a discount rate MNKINO FSF participants. Check out their classes here and sign up today!